I normally don't cook veal because it's not always readily available at my local supermarket and I haven't had the opportunity to eat it very often. When the folks of Strauss Brand offered to send me some of their free raised veal to play with in the kitchen, I was thrilled! Veal is a delicious meat and I feel comfortable preparing it, especially if I'm confident of where it came from and how it was handled. 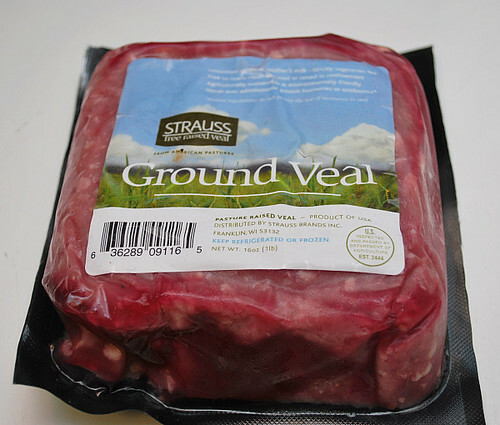 With that said, Strauss Brand offers free-raised veal and they one place I know I could trust to get veal products. These burgers were tender, flavorful and had mushrooms in every bite. I sauteed onions, garlic and mushrooms which were mixed into the veal. Patties were formed and then cooked on a skillet. The burgers were then topped with slices of swiss cheese, lettuce and tomato. For another punch of flavor and to add a creamy condiment, I also made a pesto mayo which was smeared on the bun. Heat the olive oil in a skillet over medium-high heat. Add the onion and mushrooms and cook, stirring for about 1 minute, or until they begin to soften. Add the garlic, salt, and pepper and cook for 2 to 3 minutes, or until the mushrooms soften and onions caramelize. Set aside to cool. Combine the veal, parsley, cooled mushroom mixture, salt, and pepper in a large bowl. Using your hands, mix well. Form into 6 patties. Refrigerate until ready to grill or to cook on in a skillet. Prepare a charcoal or gas grill. Lightly spray the grill rack with vegetable oil cooking spray. The coals should be modestly hot. Grill the burgers for about 8 minutes. Turn and grill for about 6 minutes longer for medium-well burgers. Top with swiss cheese during the last minute of cooking. If cooking in a skillet, cook the burgers in a hot skillet over the stovetop, using the oil and topping each one with swiss cheese and a basting cover during the last minute of cooking. Place the burgers on the bun bottoms. Top each with a slice of tomato, lettuce and pesto mayo. 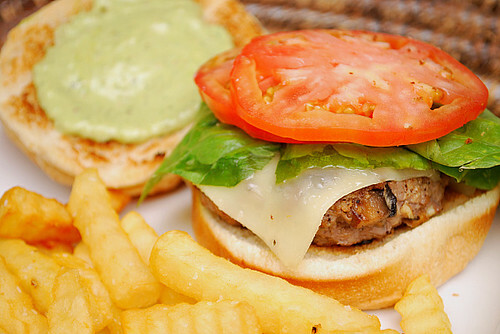 Cover each burger with the bun tops and serve immediately. Combine equal parts of pesto and mayo together and use as a condiment. Love your mayo. I can't wait to try this recipe. Thanks for sharing. I have to say, I was really impressed when I went to their website. Veal is such a challenge for me because I love things like Osso Bucco. However, like you, I object to the conditions under which veal is normally raised. I'm curious to find out more because it seems like the main reason people argue for the more traditional treatment (and in my mind less tolerable) is the fact that it produces pinker meat and a different texure. I'm curious if in a blind taste test this really holds true.